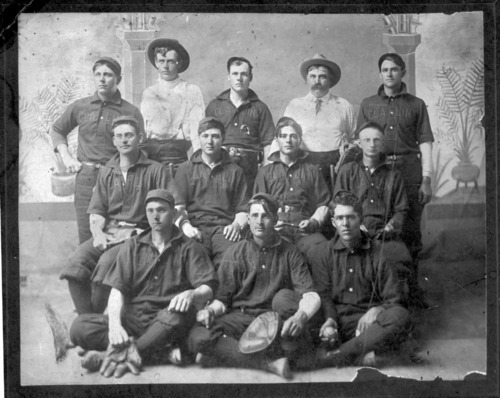 This black and white photograph is a studio portrait of a baseball team from Claflin, Kansas. Ten of the members wear uniforms bearing the town's name. Individuals pictured include the following (from bottom to top, and from left to right): Rief, Frank Bloomer (first baseman), Erwin German (outfielder), Joseph Casey (sub), Sam Lee (outfielder), Clyde McPhail (sub), Jack Mooney (second baseman), Jim Fairbairn (sub), Guy Grimm (shortstop), Vic Holm (pitcher), John Casey (catcher), and Thad Hottman (outfielder).